Understanding the Physics of Our Universe: What Is Quantum Mechanics? A century of head scratching isn't nearly enough. In 1900, German theoretical physicist Max Planck accidentally gave birth to the field of quantum mechanics (aka quantum physics) when he tried to investigate why the results of his black body experiment did not match the laws of classical physics. He discovered that energy is discharged in small packets (called quanta) and seemed to be emitted in wavelengths. Since then, Einstein and other physicists used his study and, in so doing, drove the advancement of quantum physics, the field of science that deals with the behavior of matter and energy at the smallest atomic (and subatomic) scales. Planck was eventually awarded a Nobel Prize for his work. On the other hand, the world of physics has been a ball pit of uncertainties since. Thanks to this work, our eyes have been opened to a chaotic universe—one where particles pop into and out of existence and everything is in a constant state of flux. 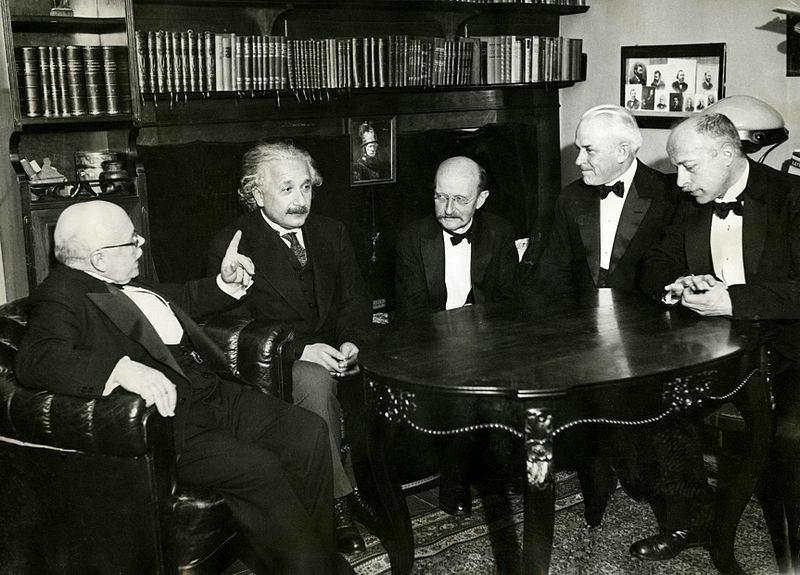 Left to right: Walther Nernst, Albert Einstein, Max Planck, Robert Millikan, and Max Von Laue in November 11, 1931. In order to understand quantum physics, you have to throw all sense of logic out the window. Why? Unlike classical physics, quantum physics does not honor the same logic that applies to our everyday surroundings. Quantum particles follow a different set of laws—laws which, to date, we still do not fully understand. For around a century now, physicists all over the world have been trying to make sense of quantum phenomena. But so far, all attempts to unify quantum mechanics with the common physical laws of our everyday environment have been in vain. We are left with several probabilities instead of certainties. To begin with, the standard definition seems simple enough: Quantum mechanics is “the branch of mechanics that deals with the mathematical description of the motion and interaction of subatomic particles.” Part of the issue with this is that measuring atomic positions accurately is a horrendously tricky (and practically impossible) task. As the uncertainty principle states, measuring quantum positions even with something as gentle as light would knock the atoms around because everything (including light) has momentum, rendering any measurement automatically inaccurate. How can we really advance if we can’t truly get accurate measurements? And sadly, this is just the start of the problem. Quantum particles (seemingly) do as they please, when it pleases them, making it practically impossible to replicate results of an experiment—a fundamental validation requirement of the scientific method. In fact, even Einstein, who himself helped breathe life into the field of quantum physics, hated quantum physics. It is unpredictable and, most of the time, illogical (or at least counter intuitive). Take, for example, wave-particle duality, which shows that light exhibits properties of both particles and waves. The double-slit experiment is one of the most basic experiments in quantum physics, yet it remains one of the biggest mind-bogglers of all time. In this experiment, atoms are seen behaving as both a particle and a wave depending on the presence of interference. And it seems as if they have a mind of their own, distributing themselves into forming an interference pattern. “If you can explain this using common sense and logic, do let me know, because there is a Nobel Prize for you,” British theoretical physicist Jim Al-Khalili says. And things get far stranger. The emptiness of the universe: This is the kind of stuff that the early pioneers in quantum mechanics believed in—and the kind of thing that most people still believe in. But this picture of the universe is wrong…quantum physics tells us so. In the 1920’s, researchers thought that emptiness — an absence of stuff — is what quantum mechanics was talking about. Arthur Eddington’s “The Two Tables” is a really nice treatment of the subject. In this piece, Eddington essentially argues that there are two tables: First, there is the table of everyday experience. It is a table that we can see and interact with. It is comparatively permanent, it is coloured, and (above all) it is substantial. Second, there is the table of science. This is something that is intangible. It is mostly emptiness with numerous, sparsely-scattered electric charges rushing about with great speed. However, this metaphor is (of course) wrong. The atom is a crazy soup of electrons, positrons, quarks, photons, gluons, and so on. These are popping about and annihilating one another. It just happens that they are so evenly cancelled out that the “empty space” picture, which was given to us by the 1920’s quantum mechanics, describes it extremely well. As was noted, this emptiness is not an accurate depiction of what is actually going on. The deviations, that we can test, go into Quantum Field Theory. What people living in the 1920’s did not realize is that “empty space” is not what we think it is — it is a soup of a lot of things that average out to zero. Like thermodynamic equilibrium, i.e. “no net flow” is nowhere near the same as “no flow” at all! The potential repercussions of wielding the seemingly untamable field of quantum physics—of nailing down a solid theory of it all—are immense. Understanding quantum phenomena is the key to unlocking a vast world of powerful possibilities in relation to our ability to manipulate the world around us. Quantum computers rely on the state of superposition to perform far more complex tasks using less steps than conventional computers. Theoretically, quantum computers can run more operations than there are atoms in the universe. These materials transmit electricity without any energy loss but currently only work in cryogenic temperatures. Physicists are currently figuring out how to make superconductors work at room temperature. The identities of these invisible, mysterious particles/energy that make up around 98% of our universe remain unknown. We know more on what it’s not than what it is, and can only detect them through their gravitational force. Ironically, not only are the smallest particles known to man also the most difficult to understand—they also govern the biggest, most powerful phenomena in our universe. So to answer the question, “Where are we now in the field of quantum physics?” While we have undoubtedly gone a long way in understanding and harnessing the powers of quantum phenomena, we are mostly still in the dark. If you believe you have the mental capacity and stamina to join the quantum physics field and make all this a little less crazy (or at least try to), humanity will thank you for it. Also, Nobel Prizes are at large. Loopholes in the Laws of Physics: Can Time Crystals Actually Exist? In a Post-Silicon Era, is DNA Computing the Answer?